The Door County ferry to Washington Island. Jeanne O’Connor photo. Jutting out from Green Bay into Lake Michigan, Wisconsin’s Door County is a peninsula that is a world apart and a visitor’s delight. Visiting Door County is like having a picture postcard come to life. The many villages with their Cape Cod-style architecture are charming. It is not surprising that this area is frequently referred to as the midwestern Cape Cod. It’s a world without any chain restaurants or big-box stores. How delightful. How retro. It’s also located on the imaginary line that places it half way between the Equator and the North Pole. Villages with names like Egg Harbor, Fish Creek, Ephraim (where by ordinance, buildings must be painted white), Bailey’s Harbor and Whitefish Bay are only a few of the delightful destinations. There is a different story to be learned about each village’s name when you visit. Some names are historical and some humorous. Surprisingly, the villages manage to maintain an individual flavor. Door County is a relatively small land area, about 70 miles long, but it offers visitors much to see and do. Live theater is a feature of the American Folklore Theatre in Peninsula State Park Amphitheater (open air) in Ephraim. The 500-seat Birch Creek Music Performance Center features a diverse program in the historic Egg Harbor barn. The Third Avenue Playhouse features live performances in a converted Sturgeon Bay movie theater. Eight lighthouses on the peninsula plus three on the mainland are a bonanza for lighthouse buffs. The county boasts a total of eight local wineries, enough to warrant a brochure publicizing the Door County Wine Trail. Each winery offers a distinctive array of wines with its own label and, of course, the ever-popular tastings. Art happenings abound in almost every village. The Door County Arts Map helps visitors find things of special interest. In fact, colorful and informative brochures about the venues of Door County are available at almost every stop that visitors make. Every village has an abundance of eateries, with water views whenever possible, that makes choosing just the right one a toss of the dice. Since this is a tourist-based economy, most restaurants feature menus for all meals. Locals will bend over backward to be helpful and answer almost any question. Just ask. It was a relief finally landing in Green Bay after a long travel day. Driving on the bridge over Sturgeon Bay Canal onto the Door County peninsula, I arrived in time for dinner at The Cookery in Fish Creek, with its laid-back atmosphere, unique local specialties and local beer. The Cookery’s menu included interesting selections of local fish, imaginative food combinations and a nice choice of selections for vegetarians. This 70-mile sliver of land defies a single description as a destination. It has 300 miles of shoreline, is famous for its endless rows of cherry trees, a collection of unique communities, boutique shopping, picturesque lighthouses, and two ferry-only accessible islands on its north end that transport visitors to yet other worlds. Before leaving the peninsula, consider the many available outdoor activities from which to choose: hiking, biking, boating, fishing, camping and other possibilities. 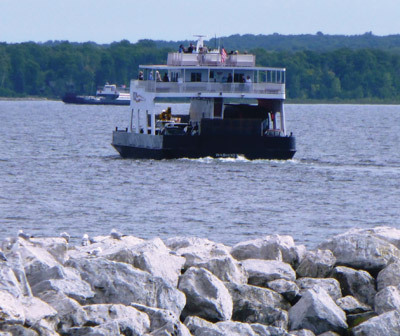 The ferry to Washington Island travels over waters so treacherous that early French explorers named the area “Portes des Morts” or Death’s Door. This is where Door County got its name. Have no fear, though. You are traveling in a large ferry, not a birch bark canoe. 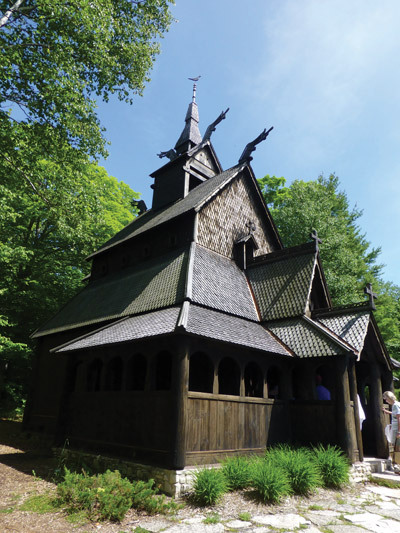 The Stavkirke (Stave Church) design is based on a 12th-century church in Borgund, Norway. Jeanne O’Connor photo. In 1850, Washington Island became home to the second-oldest Icelandic settlement in the U.S. An interesting stop on the way to the Rock Island ferry while still on Washington Island is The Stavkirke, a replica of a church whose design was common in Norway in medieval times. It is definitely a picture-taking moment.